I know. I know. It has been over a year since my last post. I'm not sure why I quit writing. Life? Lack of inspiration? Busyness? Whatever it was, I'm back. Hopefully more frequently than once a year. Our school district let us off on Thursday and Friday so families could prepare and evacuate if they felt the need. I never felt the need to evacuate - just prepare as best as we could. We cleared the back patio, put sandbags down by our patio doors leading inside, covered our front windows with plywood, bought hurricane snacks and non perishable food, filled every container we could find with water, and hoped for the best. Our biggest concerns were the large oak trees on our property and praying if they decided to go down, they would go down in such a way that they wouldn't damage any property. Well, those prayers were answered. They stayed upright (although it's a high priority to top one off and bring one down in the near future). Gabe and I slept through the worst of the storm while my hubby stayed up until the wee hours praying over our home and others. Irma took away a lot. As we emerged from our home Monday morning around 7:30 to survey the damage, we were overcome with gratitude that our home had been spared. Others were not so lucky. A sweet family I know (I worked with the mom and taught their daughter last year) lost everything when their home flooded late Sunday night. Two homes in our neighborhood were damaged due to fallen trees. One neighbor had someone's mangled shed in their yard. Multiple fences were down. Most people were without power. As we drove around our surrounding area, we found more devastation. Trees on top of roofs or through roofs and on cars and in the road. Power lines strung across roads blocking people from exiting their neighborhoods, flooded streets, power poles snapped in half like tiny twigs. Irma didn't just take away people's material things - she took away a sense of comfort and normalcy and security for many. She took away in a matter of hours what people had worked for years to build. She took away life as we know it. For some, it was absolutely devastating; for others it was a minor inconvenience in comparison. Being without power is no picnic. We have been one of the lucky ones to be without power for less than 48 hours. Others are still without it and going on Day 6. Pray for them and pray for our linemen working 16 hour shifts to restore and rebuild. They are amazing. Yes, Irma took away a lot. But not everything she took away will be missed. You see, she also took away (at least for now) division - division by race, ethnicity, religion, economic status, etc. No one was asking what your belief system was or how much money you had in the bank or what nationality you were or who you voted for before pitching in to help. Neighbors helped neighbors. Communities helped communities. Black and white helped each other. Christian and non-Christian helped each other. Rich and poor helped each other. The media would have you believe that we are more divided than ever. But I can tell you from what I've seen of my community this last week, that is simply not true. That's another thing Irma took away - constant coverage of the "racial divide." Instead of hearing about white supremacist groups and the taking down of "offensive" statues and how awful our president is - the focus was on the swirling monster in the sea headed for Florida. And yes, afterwards the focus is on the devastation. But not for most. Most are focused on helping. I have seem more good in these last few days than I have in a very long time. We seem to appreciate each other a little more. She also took away excuses. So many times people use excuses to not help. Whether it's their schedule or family life or what have you, (and I'll confess I've been the excuse maker more often than not) people didn't use excuses. If they couldn't do physical labor, they offered to provide meals or open their homes to those without power. She took away pride - the dangerous kind of pride - and replaced it with humility. 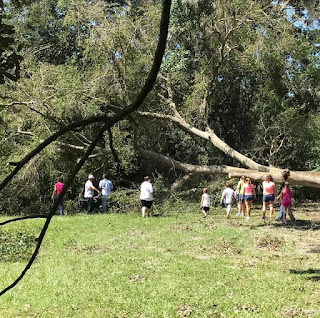 On Monday morning as the sound of Irma's howling and screaming winds gave way to the sound of generators and chain saws, the nervousness and fear she brought with her gave way to gratitude and a sense of unity. We all went through this together and so naturally, we all came together to help one another and "love thy neighbor." So yes, I'm certainly not a big fan of Irma. She did a lot of physical damage. She tore apart houses and flooded streets. She uprooted trees. She snapped power poles in two. But in a way I also have some appreciation for her since she also seemed to take with her the hatred and bitterness and divisiveness we'd all been hearing so much about recently. I hope it never comes back. I hope this sense of unity and belonging no matter who you are stays around. Let's continue helping and loving and being the hands and feet of Jesus. I mean, what do we have to lose?